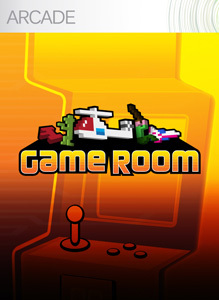 "Game Room replicates the old-school look, sound, and feel of a retro video game Arcade. Create a brand new social environment your Avatar can explore, personalize your game room by arranging your cabinets, and decorate each room with themes and animated mascots. Invite your friends on Xbox 360 or Windows PC to check out your games collection. With weekly new title releases, your arcade will be retro-fitted to perfection." "Grab your quarters! Straight from the '70s and '80s, Game Pack 001 features eight arcade games from Atari and Konami, three Atari 2600 games, and four Intellivision games." "Grab your quarters! Straight from the '70s and '80s, Game Pack 002 features seven arcade games from Atari and Konami, four Atari 2600 games, and four Intellivision games."